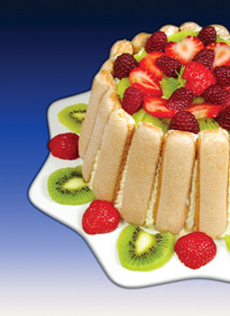 A molded charlotte is also adapted into the cake style above, filled with custard and topped with fruit. Photo courtesy London Cakes And Bakes. The “C” page has the most custard types of any letter of the alphabet, including caramel custard, cream custard, crème brûlée and custard pie. Use this index bar to visit other pages. With caramel custard, caramelized sugar is mixed into the custard prior to baking. 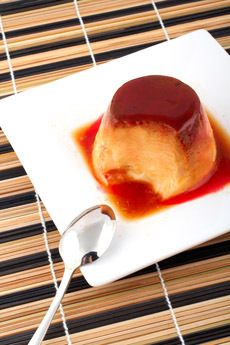 Don’t confuse it with crème caramel (flan), where a layer of caramel is added to the bottom of the mold, creating a dark caramel top and sauce when the custard is unmolded. October 3rd is National Caramel Custard Day. Caramel custard is not the same as crème caramel (flan). Photo | Foodgawker. A molded custard that can be cold or hot. Traditionally, the mold used is smaller in diameter at the base than at the top, or bucket-shaped, but almost any mold is acceptable. 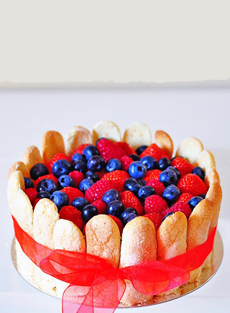 For a cold charlotte, the mold is lined with sponge cake, ladyfingers, biscuits or bread and filled with layers (or a mixture) of fruit and custard or whipped cream that has been fortified with gelatin (Bavarian cream) or mousse. The dessert is chilled thoroughly and unmolded before serving. The original charlotte, a fruit pudding with a lady finger shell (created in a mold like the one below), is said to have been named for Queen Charlotte, wife of King George III of England (Mad King George, 1738-1820). Charlotte Russe, made with a Bavarian cream center, was created for the Russian Czar Alexander by the great chef Marie-Antoine (Antonin) Carême, who decorated it elaborately with whipped-cream rosettes. Apple Charlotte (Charlotte aux Pommes) is typical of a hot charlotte, which uses a buttered-bread (or brioche) shell filled with sweetened fruit or fruit purée, baked and served hot with fruit sauce. In an Apple Charlotte, the apples are sautéed with Calvados, an apple brandy. A charlotte mold. Photo courtesy Paderno. A cheesecake is essentially a baked cheese custard. A pie is a custard when an uncooked custard filling is poured into an unbaked or partially baked pie crust, and then baked. Thus, the cheesecake is actually a pie! Similarly, pumpkin pie is a pumpkin custard, lemon meringue pie is a lemon custard. A cream pie, on the other hand, starts with a fully baked crust. A cooked filling is poured into it; the pie is then chilled until the filling sets. Cheesecake is a cheese custard pie, quiche is a savory custard pie. Photo courtesy IST. Baked custard which has had shredded coconut folded in prior to baking. It can also be garnished with toasted coconut. This custard is most often found in the form of coconut custard pie. Baked custard which has had instant coffee folded in prior to baking. While many people search for “cream custard,” the term they should be seeking is custard sauce or crème anglaise, the pourable, unbaked version of custard that is used as a sauce. Seek no more: Here’s a quick and easy recipe. Over low heat, or in a double boiler over hot water, combine 6 large egg yolks, 1/4 cup sugar, 2 cups scalded whole milk and 1/8 teaspoon salt until the custard coats a spoon (about 7 minutes). Cool, flavor to taste with 1-2 tablespoons of brandy, dark rum, Grand Marnier or other orange liqueur or sherry, or 1 teaspoon or more of vanilla. Jar and refrigerate until ready to use—you can keep it for a week. 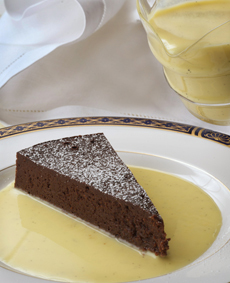 Also see crème anglaise, below. Cream custard, a.k.a. crème anglaise. Photo by Mysid | Wikimedia. 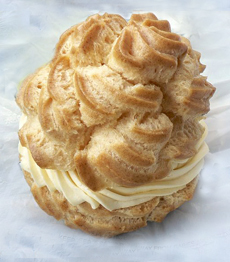 A cream puff is a choux pastry (pâte à choux) filled with whipped cream or custard. It originated in Italy in the 1600s and is said to have been created by Poelini, a chef to Catarina de’ Medici; in 1533 she married the duc d’Orléans, the future King Henri II of France, and brought her favorite foods (including ice cream) to France. The name derives from the old French meaning “to cherish,” which is the same as the word for cabbage (choux). Some say pâte à choux, or cabbage paste, is so named because the cream puff looks like a cabbage, but “cherish” has a stronger hold. Cream puff. Photo courtesy of American Egg Board, IncredibleEgg.org. The paste is a mixture of water, butter and flour which rises due to steam expansion. It crusts on the outside, trapping steam inside, creating a puffed shape with a hollow interior to be filled. The pastry is finished with a glaze. Classic French desserts made with cream puff pastry include croquembouche, éclairs, Gateau St. Honoré and profiteroles. 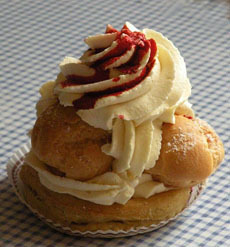 The cream puff debuted in America at the 1924 Wisconsin State Fair. The French word for cream as well as custard (of which cream is a key component). 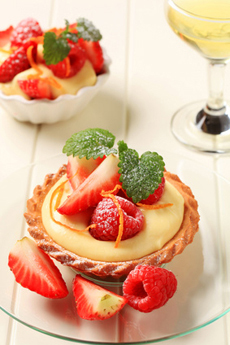 French for “English custard,” crème anglaise is a rich, pourable custard sauce that can be served hot or cold over cake, fruit or other dessert. Made with eggs, sugar and milk or cream, it is stirred over heat until it thickens into a light sauce. However, it’s a delicate operation: too much heat turns it into scrambled eggs! Vanilla is the basic flavoring, but coffee, chocolate or liqueurs can be added. With additional yolks and with heavy cream, it becomes the “custard” used for French ice cream. With additional yolks, gelatin, whipped cream and flavoring, it becomes Bavarian cream. Here’s a recipe. Cream puff. Photo courtesy Donna | Ruhlman.com. Custard thickened with gelatin, for pastries. The richest and thickest of the three classic, silky, baked French custards (crème caramel and pot de crème are the others). All three are made from eggs, sugar, milk and/or cream in different proportions, along with a flavoring such as vanilla. Crème brûlée is made from heavy cream and egg yolks, and is topped with a brittle layer of caramelized sugar (brûlée is French for “burnt,” crème brûlée means “burnt custard”). The sugar is usually burned under a salamander or other intense heat source. Crème brûlée can be served cold or warm, and is usually served in individual ramekins. While the traditional custard base is flavored with just vanilla, variations include chocolate and the entire international spice cabinet, liqueurs, green tea, etc. Crème brûlée. Photo courtesy SXC. The Spanish crema catalana, which has been made since the 18th century, predates the French crème brûlée, which dates from the late 18th century, and the U.K.’s Cambridge Burnt Cream or Trinity Cream, which was introduced almost century later, in the 1860s. 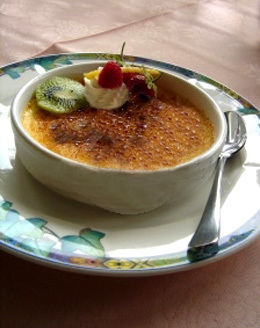 While the name crème brûlée is French, culinary experts agree that the recipe originated in England. Escoffier and the other major French chefs of the time do not include the recipe in their classic cookbooks. FoodTimeline.org cites English food authority Jane Grigson, that recipes for the dish appeared in 17th century cookbooks. By the turn of the 20th century it had become a favorite dessert at Trinity College, Cambridge, and, according to Jane Garmen in ”Great British Cooking,” it is often referred to as 'Trinity Cream. Culinary experts generally agree that crème brûlée originated in England. Recipes for “burnt cream” have been included in Creole cookbooks since the 19th century; In Mastering the Art of French Cooking, Julia Child and her co-authors say the dish is of Creole. The lightest of the classic French custards, crème caramel is made with whole eggs as well as yolks, milk as well as cream. 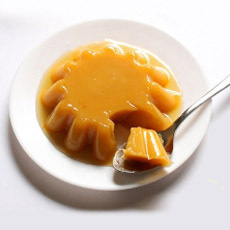 Caramel syrup is poured into the mold or ramekin before adding the custard base. After the custard has set, it is unmolded, leaving the caramel sauce on top and pooling around it. Note that crème caramel will usually cook much faster than the other custards because of the extra egg whites—their proteins coagulate at a lower temperature than egg yolks. Also due to the egg whites, crème caramel is stiff enough to stand on its own. Crème caramel came to the U.S. in the 19th century via New Orleans, but did not become popular until the 1980s when it was introduced by French chef Alain Sailhac of New York’s Le Cirque restaurant. See photo at top of the page. A delicious dish of crème caramel. Photo by Rafa Irusta | Dreamstime. Crème chiboust (CREHM shi-BOOST) is a crème pâtissière that has been lightened with stiffly beaten egg whites (Italian meringue). Some people use whipped cream to lighten, but this variation is actually called mille-feuille cream. Crème chiboust is flavored with vanilla, orange zest or liqueurs. Mixed with fruit, it becomes crème plombières. The original recipe was purportedly created by a pastry chef, M. Chiboust, proprietor of a pastry shop on the rue Saint-Honoré in Paris, to fill the gâteau St. Honoré he created in 1846. The filling is also called crème Saint-Honoré or simply Chiboust. The filling is also used for the Paris-Brest pastry. Crème pâtissière is used to fill cream puffs, éclairs and other pastries. Pastry cream—a stirred custard thickened with cornstarch or flour and typically flavored with vanilla, although other flavors can be used. It is used to fill cream puffs, éclairs and napoleons, or as a base for fresh fruit tarts. It is made of egg yolks, sugar and cream or milk like crème anglaise, but the addition of starch (e.g. flour) gives it the stability to be brought to a boil. 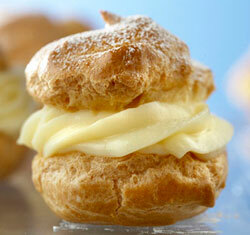 With the addition of beaten egg whites, it becomes a crème Centronics, a filling for cream puffs. Crème pâtissière is the equivalent of confectioner’s custard, although the English confectioner’s custard is less rich kind than French crème pâtissière. Crème chiboust is used to fill gateau Saint-Honore. Photo by Chatsam | Wikimedia. Pastry cream (crème pâtissière) or crème chiboust into which fresh fruits are folded. It is spooned over sponge cake or ladyfingers, then chilled. It can also be eaten from a dish, like mousse. A crème pâtissière with stiffly beaten egg whites added, used as a filling for tarts and cream puffs, and as a dessert cream. It can be flavored with virtually anything: vanilla, chocolate, liqueur, grated orange peel, etc Gateau St. Honoré, or St. Honoré cake, is named for the French patron saint of bakers and pastry chefs, Saint Honoré (Honoratus, bishop of Amiens, d. 600 C.E.). It is a base of puff pastry with a ring of pâte à choux (cream puff pastry) piped on the outer edge. Small cream puffs are dipped into caramelized sugar and attached side by side on top of the circle of the pâte à choux. This base is traditionally filled with crème chiboust and finished with whipped cream, using a special St. Honoré piping tip. See chiboust, above. The French word for creamy, cremeux (CREA-muh) is a pudding made from eggs, cream, milk, sugar and chocolate or other flavoring. The eggs make it richer than an American pudding. It is best served in in ramekins, custard cups or Martini glasses, garnished with whipped cream or mascarpone plus berries or toasted slivered almonds. Not a custard because it lacks cream, curd is made from fruit juice, typically citrus, plus sugar, eggs and butter. It is used to fill tarts, as a spread and as a base for mousse. Custard is a range of preparations based on milk or cream and eggs, thickened with heat. Most commonly, it refers to a dessert or a dessert sauce; but custard bases are also used for quiche and other savory foods. Custard tart. Photo courtesy SXH. 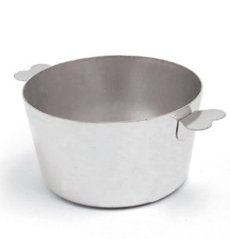 Ramekins used to bake custard in individual portions. They can be porcelain, earthenware or Pyrex, elegant or simple. The classic shape shown in the photo can be purchased on Amazon. See a photo of Pyrex custard cups on the previous page. See frozen custard ice cream. 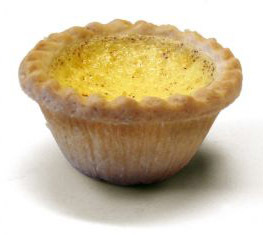 An open (single crust) pie, tart or tartlet with a custard filling. It can be a simple custard (cream and eggs, flavored with vanilla), chocolate, coconut, lemon, pumpkin; or a savory custard pie like a quiche. 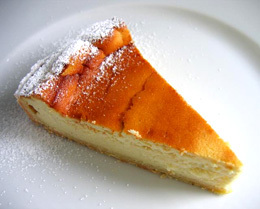 A cheesecake is essentially a cheese custard pie. See our Pie & Pastry Glossary for more information about pies. This term can refer to baked custard, to soft custard that has been thickened with cornstarch into a pudding consistency, or to any of a number of commercial pudding mixes, such as Bird’s Custard in the U.K. or Jell-O Cook & Serve Custard Pudding & Pie Filling in the U.S.
Custard tartlet. Photo by Viktor | Fotolia. 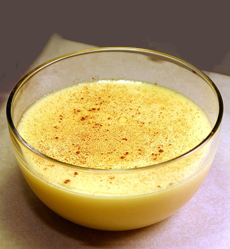 A thinner version of crème anglaise.